A functional kitchen is more that just one with a working layout and useful appliances. The modern concept of function also includes a wide variety of accessories installed behind cabinet and drawer doors to increase the kitchen's storage abilities. Long gone are the days when organizing your kitchen tools relies on make-shift custom solutions. We've compiled a list of the eight functional cabinet accessories we include in our remodels most often. Sometimes you want drawers, but you want to be able to adjust their height, or you simply prefer the look of a cabinet door instead of several smaller drawers. This is where the Interior Storage Drawers, or "roll-outs", come in. They can be used for a wide variety of items, such as appliance, dish, or food storage as in the kitchen above. They also make great use of the entire depth of the cabinet without requiring you to learn yoga to reach the contents. 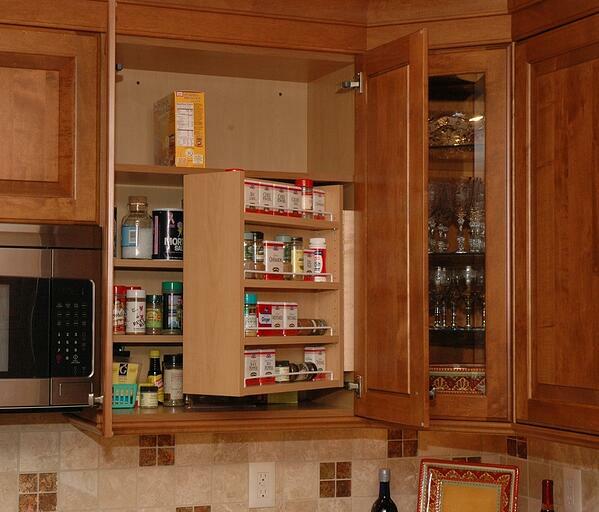 Basically a rod mounted on a track, Glideware provides fully-accessible hanging space that is stored inside a cabinet. 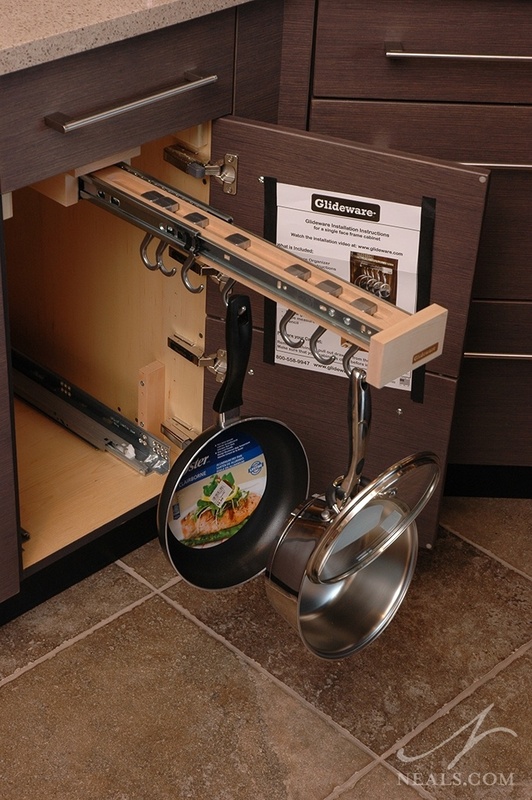 In the kitchen, this solution is perfect for storing pans. It can also be used to store bags, aprons, or anything that you would normally hang. 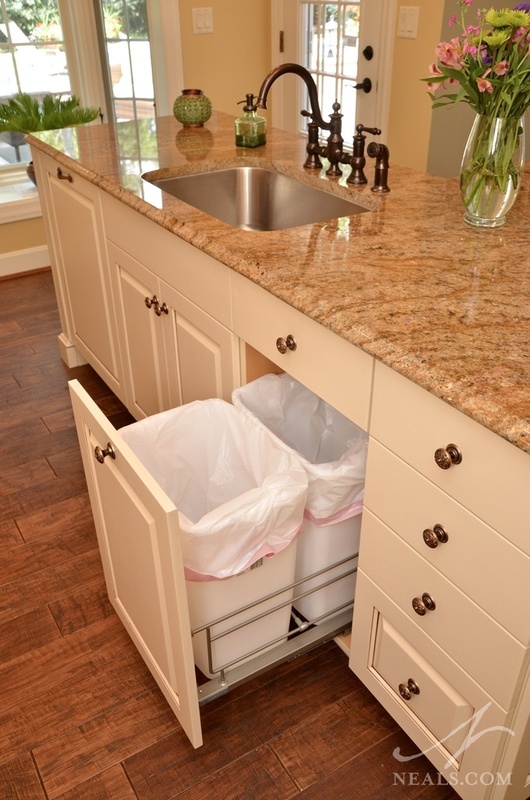 A simple solution, the double waste basket is a cabinet door mounted on a track frame that pulls out to reveal two 13 gallon kitchen trash cans. 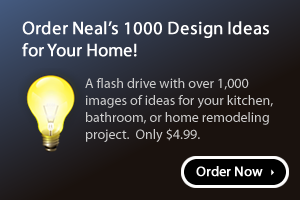 In the Neal's Design Showroom, we use one can for refuse and the other for recycle. In the kitchen above, this cabinet is placed in the center of the work triangle. 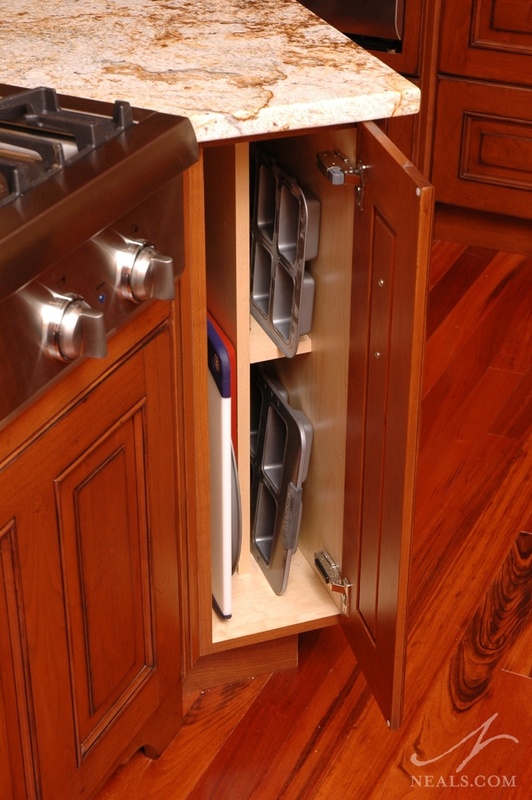 Storing baking or serving trays in a stack in a cabinet is an inefficient method. There are two common solutions available to eliminate the fuss of having to dismantle the stack to get to the item you need. One is a base tray cabinet, seen in the kitchen above- a pre-built cabinet that is available in a variety of widths- that offers a few different nooks to store trays of various size. The other is to install tray dividers in a cabinet, which provides a more custom solution. 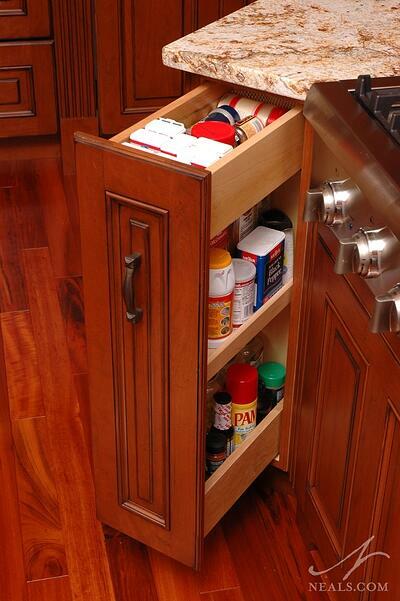 Larger cabinets, like those over the oven, are ideal for this type of functional storage. We could easily devote a whole other blog post to spice storage. 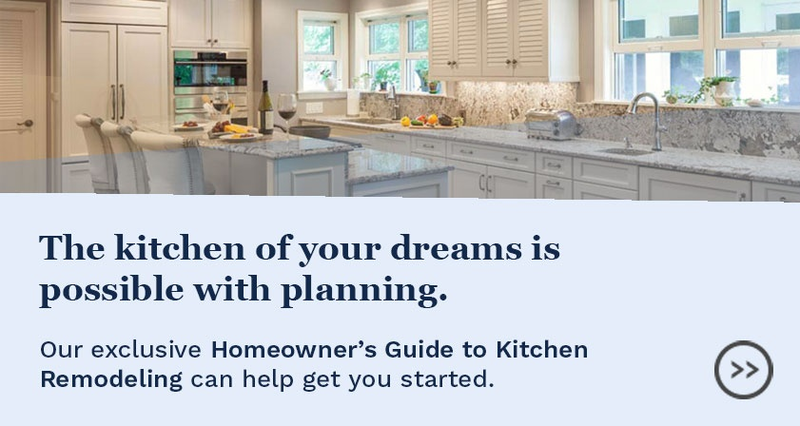 The bottom line is to review the options that fit within your budget and then make your choice based on your personal preference. 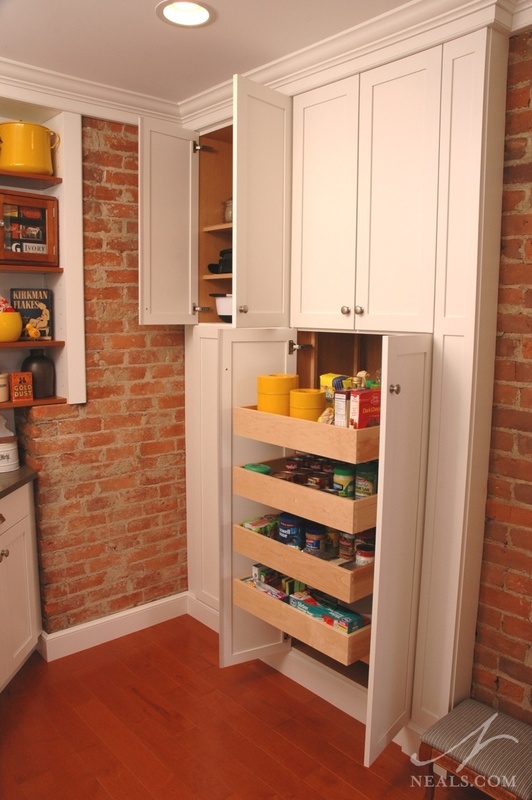 Spice storage can come in the form of narrow pull out cabinets, usually placed next to the cooktop, in-cabinet solutions with pull-out shelves, shelving mounted on the inside of a cabinet, or in-drawer units that allow your spices to lay in neat, fully-visible rows. Similar to the Interior Storage Drawers, the base pull-out looks like a regular cabinet from the outside. When opened, a column of tray-like shelves are revealed. The shelves can be rearranged in height to fit various types of items, such as spices and oils like in the kitchen above, cleaning supplies, packaged foods, small appliances, or simply to upgrade and organize the old-fashioned "junk drawer". The revolving unit, most often referred to as a "lazy Susan", is still a valuable and useful addition to kitchen cabinet interiors. 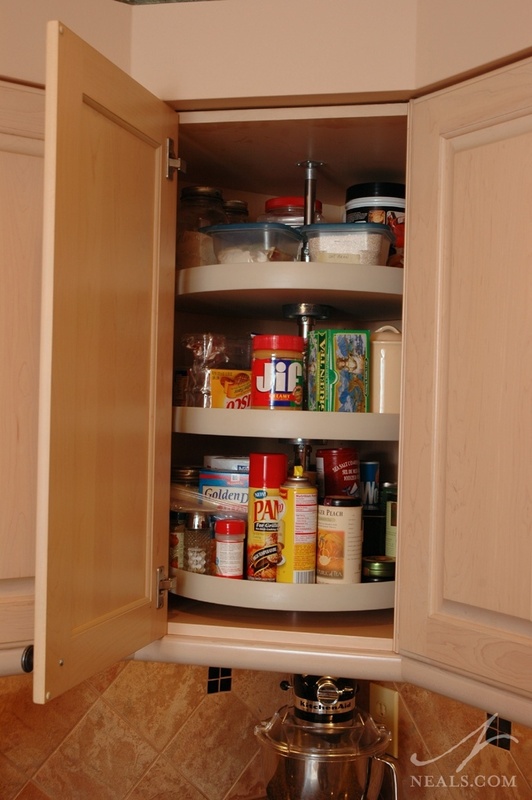 Often used in corner shelving, the lazy Susan makes use of hard-to-reach storage area by allowing you to simple rotate the cabinet's contents into view. There are a variety of units available for any budget to organize your utensiles, or the collection of odd tools used in the kitchen. If a pre-made unit doesn't exactly fit your needs, dividers can be installed in custom configurations. 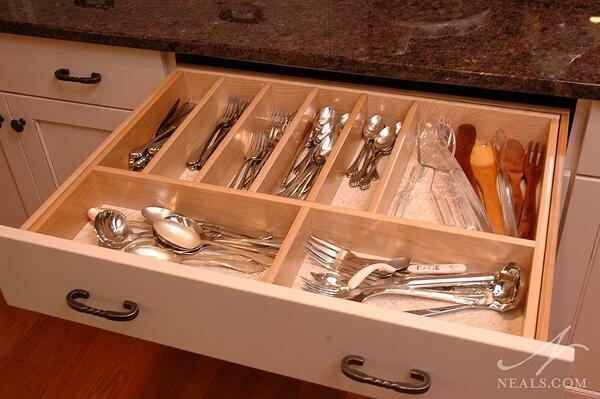 There are also in-drawer units for storing your valuable silverware to prevent tarnishing. If your kitchen will include an office or family communication center, consider including a file drawer to store important papers. You could also use a file drawer to hold recipes that aren't housed in books. If you have wine to store, check out our post on Wine Storage Solutions.